How to edit/convert swf file into video? Swf(shock wave flash) is the format of adobe Flash animation design software from adobe company . It is used widely in all kinds of websites and plays well on both windows pc and mac computers as long as you install the adobe flash player. Though it is very popular through PCs, mobile and tablet users may find it difficult to play .swf on mobile phones and tablets because most mobile phones and tablets don’t support adobe flash player. Have you ever experienced the situation that you got some interesting flash file you really want to share with your friends though mobile phones and tablets? Personally I did encounter this trouble before. As far as I know, there is few software supports to edit and converter swf such as windows movie maker (windows) and imovie (mac) which are free won’t support swf, but I did find some third party video editor software which integrate this feature. I will take the Wondershare Filmora(originally Wondershare Video Editor) which is one of the most popular video editing software for example. If you are using a mac computer, you can use the Wondershare Filmora for Mac(Originally Wondershare Video Editor for Mac). 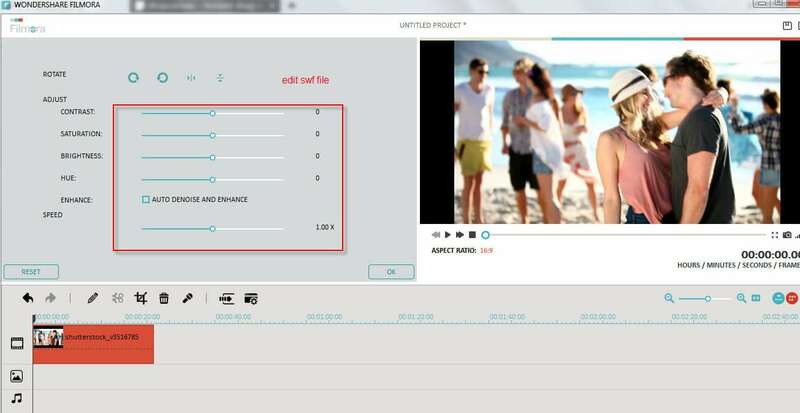 This software can help you edit and covert swf files into videos to be played on mobile phones and tablets. In this way, you don’t need to decompile your flash file and it requires no professional swf knowledge to edit . This is an extremely easy and smooth way. What is more, you can download the 30 days free trial version to try it out now! Launch the software Wondershare Filmora and then click ‘import’ button, it will prompt you to select the swf file to import and then you can drag the it from the software media library to add it to the video track. Another way to import swf is to drag and drop it from the original folder of your computer to the software video track. Note: Some copyright protected swf may not be supported, please make sure your swf are not copyright protected. This is not a necessary step though, you can skip this step if you don’t need to edit your swf. From my experience, we do need to edit swf sometimes. Given all kinds of useful tools, why not just take a few more minutes to make your swf file better? Wondershare Filmora offers you very intuitive way to edit your swf file, the most used features are trimming swf file, adding a background music and applying filters. I will recommend you spend more time to explore the software so that you can get the most out of the software. After editing, you can click ‘export’ and then you can click ‘formats’ and choose a standard video format you want to converter swf to video. Mp4 is recommended as it supported by most mobile and tablet devices and have good quality y comparing to other formats. Finally, after converting swf file, you can transfer the new video files on your mobile devices and then play it there and show to your friends. Instead of converting the video to a format saved on the computer, wondershare Filmora also offer another option for you to upload your video to social websites such as facebook, youtube and video. Then you can logon the facebook/youtube and vimeo to play the videos on your mobile phones and tablets.